"Chocolate is a perfect food, as wholesome as it is delicious, a beneficent restorer of exhausted power. It is the best friend of those engaged in literary pursuits." A little retail therapy might just be in order with the Autumn nights drawing in; the lure of a good book and the siren call of the confectioners' art is all too tempting. So, lets finish off 'Chocolate Week' with a few suggestions so that you can pursue some 'choc-lit' therapy. I have read some of these books, others I covet and are on my wish list, a few I have no idea and literally just did a random search on Google, so I cannot vouch for their content - so it's rather like a blind tasting when someone steals the chocolate box 'menu'! 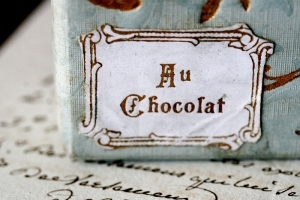 Chocolat - Joanne Harris The story of Vianne Rocher, who bewitches the people of a small, french village with her magical, artisan chocolate skills. Fabulous and different from the movie, so if you haven’t-read it, then watch the movie! and her sequel 'The Lollipop Shoes' - I have not yet read this, it is on my wish list. The story of Vianne and her daughter Anouk continues, but this time there is a spiteful cuckoo in the nest (or a fly in the chocolate!). Like Water For Chocolate - Laura Esquivel.One of my favourite books and a real gem. It was one of the first novels that I read where the heroine literally transfers all her unexpressed passion + love into her cooking with surreal, magical and surprising results. You will never beat an egg in anger again! A bit of fluffier, 'chic-choc-lit', I've never heard of or read any Trisha Ashley, but Jenny Colgan is always a light, fun read .. a chocolate mousse centre-equivalent. 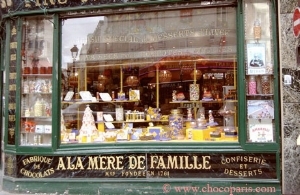 The oldest sweet shop in Paris, 1761 – could it be the loveliest too?? Charlie and the Chocolate Factory - Roald Dahl Captivating and inventive, with mad-cap confectionery. Love it, great for kids and adults alike! 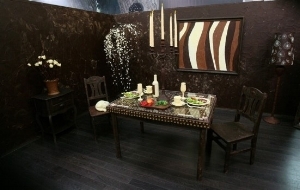 A bonkers, ‘Wonka’ inspired room made of chocolate!!! Willie's chocolate Bible - Willie Harcourt-Cooze Yes, I deliberately listed it after 'Wonka Factory'. 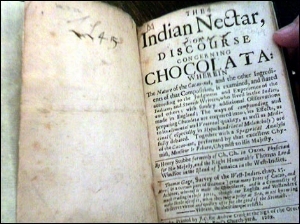 This is a fantasmagorical recipe book from the Devon kitchen of this cacao maestro. It is on my covet list, I've only leafed through some pages in a bookshop, but it's immediate choclust! 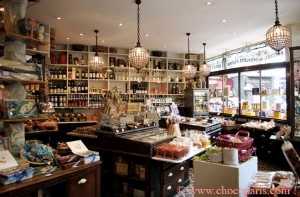 The Chocolate Connoisseur - For everyone with a passion for chocolate - Chloe Doutre-Roussel. Chloe is thechocolate buyer at Fortnum + Mason and I found this book on the internet, with mixed reviews. Still, it seems to contain lots of interesting info to dip into. The Whizz Pop Chocolate Shop - Kate SaundersThis is really a children's book about a family who take over an old confectionery shop, only to find it is haunted and all kinds of mayhem, magic + chocolate chaos ensues. Ok, books sorted, now take a leisurely amble to choose your chocolate sin of choice. There are many independent purveyor's of tongue-tempting chocolatey-ness worth visiting, preferably in person for a complete olfactory and gustatory experience! The food halls of Harvey Nichols, Fortnum & Masons, Selfridges & Harrods are also heaven sent for chocolate delectables and Fair Trade selections. ENJOY! "Chocolate is a divine, celestial drink, the sweat of the stars, the vital seed, divine nectar, the drink of the gods, panacea and universal medicine." Quoted by Antonio Lavedán, Spanish army surgeon, 1796.